This revolution will boost many sectors, but Jeff covers one in particular that will create windfall profits for early investors. If you take Route 309 North from Allentown, Pennsylvania for an hour and 15 minutes, you’ll eventually run into Mahanoy City. It’s a small town—so small that you could stroll right down the 20 blocks or so that compose Centre Street in about 15 minutes if you took your time. As such, it seems like an unusual place to be the birth of an $81 billion industry. Yet, in fact, it was. In 1948, a local entrepreneur set out to solve an important problem. Broadcast television signal reception was poor for the folks in Mahanoy City due to the surrounding mountains. The solution was to take those television signals from the top of a mountain and then distribute them over a new kind of network. That network became known as community antenna television, otherwise known as cable TV or CATV. And no one could have guessed how large the industry would become. Over the course of the next 60 years, companies like TCI, Cablevision, Continental, Time Warner, AT&T, and many others spent hundreds of billions of dollars racing to connect every home in the United States to their CATV networks in hopes of selling them multi-channel television services and, eventually, internet access. It was a massive undertaking, and one in which hundreds of companies profited from greatly over the years. And just as important, it was one of the first projects of this scale that wasn’t about roads, bridges, or canals. It opened the doors to a whole new way of thinking about infrastructure. When a company solves a big problem, it results in big profits. Take Pfizer for example – its drug, Lipitor, treated medical problems related to heart disease and became the world’s bestselling medication for well over a decade. Pfizer rewarded investors with a 50,080% return – turning every $5,000 stake into over $2.5 million. Now, a new health crisis is ravaging our country… It’s a monstrous problem. Yet, this tiny company is positioned to become the major new player treating this epidemic. You owe it to yourself to not miss out on this new profit potential. Watch this urgent investment briefing to get all the details. Right now, the world is embarking on another, similar project. Like cable TV, it’s a massive infrastructure buildout, perhaps the biggest in history: the construction of fifth-generation (5G) wireless networks. A wireless network buildout is akin to the cable TV buildout, just without the cables. Wireless infrastructure enables our phones and other electronics to communicate with each other, via the internet. This is done through the construction of cell towers. If you have a modern smartphone in the U.S.—or the developed world, for that matter—it’s likely that you’re using a fourth-generation (4G) wireless network. About once every 10 years, the world goes through a major wireless infrastructure buildout. In the 1990s, it was second-generation (2G) technology. In the 2000s, it was third-generation (3G) technology. And in the current decade, it’s been fourth-generation (4G) wireless technology. But as we can see in the chart below, 4G subscribers will peak this year and are at the earliest stages of decline. And 5G is the reason why… It’s coming a couple of years earlier than previous generations. You see, the world now has an insatiable demand for more connectivity. More internet browsing, more messages, more video chats, more streaming video… all on their wireless-connected smartphones and tablets. This demand has accelerated the migration from 4G to 5G. What’s more, 4G wireless networks are congested… resulting in poor speeds, dropped calls, and frustrated customers. 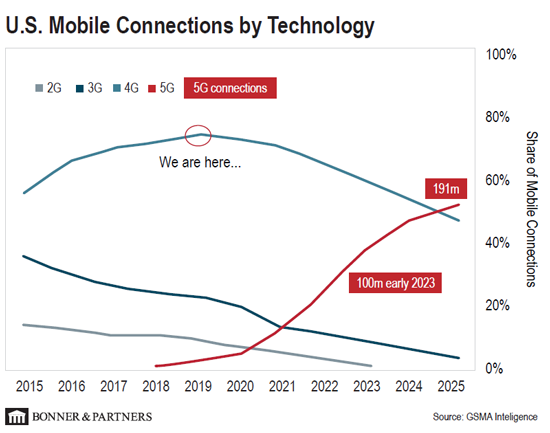 As a result, subscriber growth on 5G networks will be on an exponential growth trajectory over the next five years; it’s scheduled to overtake 4G subscribers by 2024. And for good reason… 5G technology promises connection speeds up to 1,000 times faster than what we have today. For perspective, with 5G, it’ll take mere seconds to download a feature-length movie—something that would take close to an hour today. And to make this 5G network construction happen as fast as possible, wireless carriers are going to have to rely on infrastructure companies to support this undertaking. Naturally, this will translate into tremendous investment in those companies… and windfall profits for early investors. He says, “I have evidence that Amazon may be on the verge of launching its own cryptocurrency… and I’ve found a backdoor way to rake in massive profits as soon as Amazon makes this huge announcement.” Watch this must-see video here. Of course, the bigger question of 5G is whether anyone will use it. After all, new technologies live and die by their mainstream adoption. Self-driving cars will be connected in real time over wireless networks. Companies will be piloting trucks for logistics remotely, just as drones can be flown from halfway around the world over satellite networks. We’ll be able to surf the internet and make phone calls while riding on a high-speed train up to 310 miles per hour (500 km/hour). 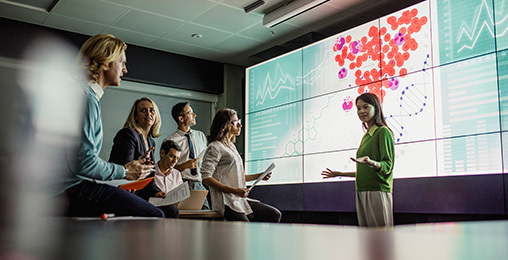 Consumers will be able to “sit in” on meetings by projecting themselves using holographic images in real time with no video or audio delay. And there will effectively be no latency (delay) over 5G networks. Latency will drop by 99% from more than 100 milliseconds down to a mere millisecond. A latency reduction like this would enable a doctor to operate on a patient with robotic surgery… over a wireless network. Clearly, 5G wireless networking technology is not just evolutionary, it’s revolutionary. And it’s all happening right now… this year—not two or three years from now. AT&T announced that it would begin offering 5G to customers in a dozen cities by the end of the year, with notable deployments in Dallas, Atlanta, and Waco, Texas. T-Mobile came out trying to upstage the other two with plans to offer 5G in 30 cities before the end of the year, including New York and Los Angeles. This is what most investors are missing. They see 5G as something that won’t really hit the mainstream for another few years… and they’re right. But when it comes to infrastructure buildouts like this, the biggest money is made in the early innings. Placing stakes in the companies working on 5G now will pay out windfall returns in a short time. For a simple way to profit off this trend, the big cell tower companies are the first place you should look. American Tower (AMT) is an easy way to gain exposure… and it stands to benefit as 5G infrastructure continues to be built. This is one of the most exciting trends on my radar today. And I’d be doing you a disservice if I didn’t put it on yours, as well. I’ve already shared four companies with readers of my Near Future Report. I expect some of these companies to at least double, perhaps more, in the next 12 months. I put together a brief video presentation with all the details right here. On Thursday, we asked you which metals you’re most excited about as a way to play the electric vehicle revolution. I am interested in copper as a commodity and investment. I agree about the demand for copper but I wonder why the price of copper stocks has dropped recently. I’d also like to know good nickel stocks. Copper, nickel, and then lithium. Our in-house commodity expert, Dave Forest, travels the world to find the top miners in the business… and right now, he has a number of high-upside copper and nickel plays in his International Speculator portfolio. If you’re not a subscriber, you can learn how to access the names of these picks—and see his No. 1 money-making opportunity today—by clicking here.